In a weekend where fan hooliganism made headlines on both sides of the pond, this week’s not-exactly-HD “Pic of the Week” comes to us from the aftermath of the Tyne-Wear Derby in Newcastle. Northeastern rivals Sunderland traveled to Newcastle to face the Magpies at St. James Park, and came out of the match surprise 3-0 winners. Unsurprisingly, this didn’t sit well with home support, who then spilled into the street surrounding the stadium and threw a temper tantrum of epic proportions. 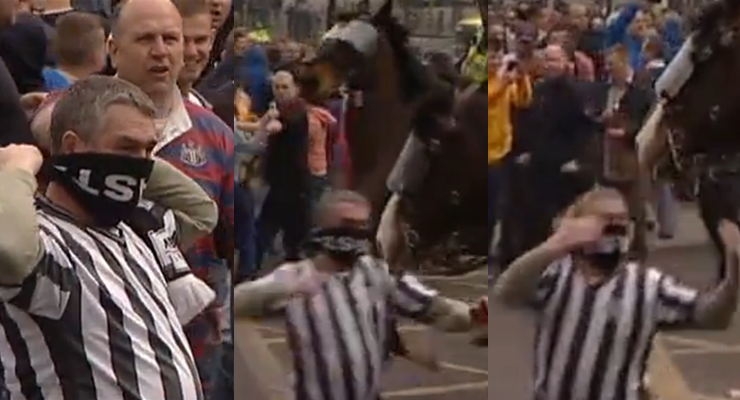 The highlight of the scenery captured though has to be footage of the man above, who thought it best to not only provoke the policemen attempting to keep the peace… but also punch one of their horses in the face. Caught on camera several times before obscuring his face with his scarf, the lug wasn’t exactly able to land a solid blow to the equestrian guardian before gesturing “Come at me, bro” several times and then being tackled by the police. However, that likely won’t stop him from having picketers from PETA marching outside his house, or avoid a date with the Newcastle magistrate sometime in the next fortnight. And for those animal-friendly readers concerned about the horse? Don’t worry, “Bud” as he’s called, has recovered well and will live to face drunken Geordies another day. I’m told this jerk probably isn’t really a Newcastle fan and isn’t even wearing a real jersey.